Adopting abandoned, abused or rescued animals is a noble cause and one to which animal lovers are quick to rally. But there are caveats to adopting any animal with a troubled past, and prospective owners should never impulsively bring home such animals without considering all the consequences, not only for the animal, but for themselves, their families, and their other pets. Only after careful consideration of what is entitled in the animal's care, feeding, housing and socialization should new owners take on such a pet. The is very true of feral cats. The first question many people must ask when considering a feral cat for adoption is whether it can be domesticated successfully. The answer, often not too helpful, is that it depends. A key factor is the age of the feral cat when it is captured. In general, the younger the cat, the greater its chance of being successfully domesticated. A feral kitten who is rescued at the age of six to eight weeks, vaccinated and neutered at an appropriate age has as much success as any kitten of becoming part of a family. Feral cats who have been on their own in the wild for years, possibly having little or no contact with humans, make poor candidates for domestication. Another factor is environment. If you live in a small apartment in the city and want an indoor cat, a feral cat is probably not a good choice. The cat would be miserable and it wouldn't be long before both you and your apartment were torn to shreds. If you live on a farm, however, and are looking for a barn cat to control rodents, a feral cat is ideal, so long as it gets along with any cats who already live there. Finally, there is an issue of gender. Unneutered male cats tend to be more aggressive than females, but once neutered, either gender has a better chance of being tamed successfully. Before brining it home, have the cat examined by a vet, vaccinated, and treated for fleas (which can cause anemia in cats if left untreated) and other parasites. Although the FCC does not routinely test or vaccinate for tested for FeLV/FIV/FIP because its focus is spaying/neutering, most veterinarians will advise you to have a cat you are adopting tested and vaccinated, especially if you have other cats at home. Be patient while socializing your feral cat. The FCC offers an excellent guide to socializing kittens at http://www.feralcat.com/taming.html. Spay or neuter your pet! Kittens can be neutered as young as eight weeks and the only way to prevent the feral cat problem from continuing is preventing further reproduction. 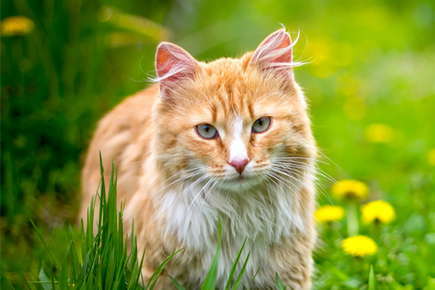 If you have the patience, love, and proper environment, your feral cat can turn from a wild thing into a real pussycat and you'll have a well behaved and happy pet.